Liz Peace ran the British Property Federation for 13 years before retiring in December 2014. She then embarked on a portfolio/advisory career in the field of property, politics and the built environment. This includes non-executive roles at Morgan Sindall plc, Redrow plc, Howard de Walden Estates, Turley, Good Relations Property, Holtby Turner and EC Harris. Liz Peace is also involved as a Trustee at Peabody, the Churches Conservation Trust, the Architectural Heritage Fund and the property industry's charity, LandAid, where she is a Chairman. 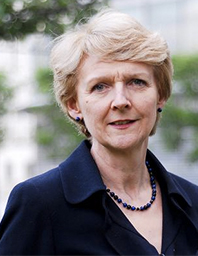 Before her BPF life, She spent 27 years as a civil servant in the Ministry of Defence working on an exciting range of projects from nuclear safety, to defence finance, public inquiries and land acquisitions. For the latter 10 years She helped set up and then move towards privatisation the defence research establishments which became QinetiQ plc. In 1985 she pioneerd the principle of part-time working for women in the MOD. In 2017, she’s been appointed Chair of the Old Oak and Park Royal Corporation.